How does aromatherapy work? How can it enhance our life? Aromatherapy is the art and practice of using essential oils extracted from aromatic plants and herbs to restore or enhance health, beauty and well-being. How does aromatherapy work? Well, it depends on the method of using essential oils. Of the three methods mentioned above, Inhalation has the quickest effect. The molecules of essential oils work when they are inhaled because, aromatic molecules interact with the surface of your nasal cavity. 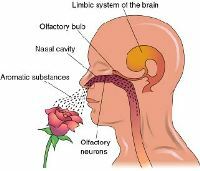 And by tiny olfactory nerves located in the roof of the inner nose, these aromatic molecules are transmitted to the part of the brain called the limbic system. The limbic system interacts to control the heart rate, blood pressure, breathing, memory, stress level and hormone balance. This is why essential oils have such a powerful effect on our moods and general state of mind. This form of absorption is most efficient when inhaling essential oils from a tissue, diffusing them in a vaporizer, or adding them to your bathwater. Topical method is used on your skin, if you have a bruise. A bruise needs a topical compress, not an inhalation. This is effective even if you have problem with your skin (like acne, sun burn, etc.). You should use topical method not inhalation. Essential oils when applied to your skin are not greasy and many of them do not leave oily marks behind. These oils easily penetrate through the skin and get absorbed into the bloodstream. When you apply essential oils to the body, these essential oils will penetrate into the skin by the hair follicles and sweat glands in your body. These oils are then absorbed into your own bodily fluids, which aid in the killing of harmful bacteria and viruses. The oils also have the ability to stimulate your bodys immune system, which will prevent future attacks by strengthening your resistance to illness and germs. Certain essential oils will help by increasing circulation in your body, as well as helping to effectively eliminate bodily toxins. Other types of essential oils will stimulate new cell growth and help your body learn how to better heal itself. Every individual essential oil has its own characteristics and aroma, which all exhibit very different properties and personal benefits that are unique. No two essential oils are quite the same. However, we cant directly use essential oils to our skin without diluting them with carrier oils. Essential oils are very concentrated; therefore we must use it carefully. It is best to understand how to use them safely. If your skin is sensitive, you can test the skin by placing a small amount of diluted oils to your inner arm. Do not use the oils if it causes redness or irritation. While tinctures are a common way of using herbs, essential oils are rarely taken orally by therapists. This could be because most aromatherapy training suggests the oral method is fraught with danger. However, many essential oils may be administered orally with safety. Oral ingestion can be an option, but only under experienced medical supervision, SOME OILS CAN BE TOXIC, and other even seemingly harmless oils should not be used under certain conditions. (If you are pregnant, or have specific medical needs). Some essential oils are listed for oral use and are often major ingredients in mouthwash and dental care product --- clove, tea tree, myrrh, thyme, and peppermint. Now, we know how does aromatherapy work and how it can enhance our body and spirit. One thing that you need to keep in mind is that all of the results of aromatherapy are specific and individualized and will vary from person to person. It may be hard to believe, but there are no two people in the world that will react and be influenced by an essential oil in exactly the same way. You need to take into account that the same person can be impacted different by an essential oil with each use, and this is contingent on your surroundings, the time it is take, or the mood youre in at the time. Treatment methods with Aromatherapy Oils varies with the nature of your illness. Find out the various methods you can use with essential oils & how you can prepare your own oils.